Today marks the beginning of a Netflix experiment as their $100 million investment into their original TV series House of Cards has finally made its much anticipated debut. As a remake of the original BBC series from the 1990s, this version stars Kevin Spacey with the series directed by David Fincher. The first episode will be free to the public for viewing. If the whole thing is steeped in moral gloom – I scoured the screen in vain for a character not driven by greed or pride, lust or vanity – it finds its perfect expression in Fincher’s gliding, crepuscular cinematography. A master of murk, the director of Se7en and Zodiac can cram more shades of grey into a single frame than EL James will fathom in a lifetime. It all adds up to something quite mesmerising and, already, addictive. Just be sure to watch it with the lights turned out. With its Friday launch of House of Cards, it is safe to assume Netflix viewers will be watching this all weekend (minus Superbowl Sunday). Netflix previously launched another original series, Lilyhammer, last February. On May 4th, Netflix will exclusively debut 14 episodes of the cult TV series, Arrested Development, as part of its fourth season. Click here to sign up for Netflix–it’s $7.99/month and the first month is free. 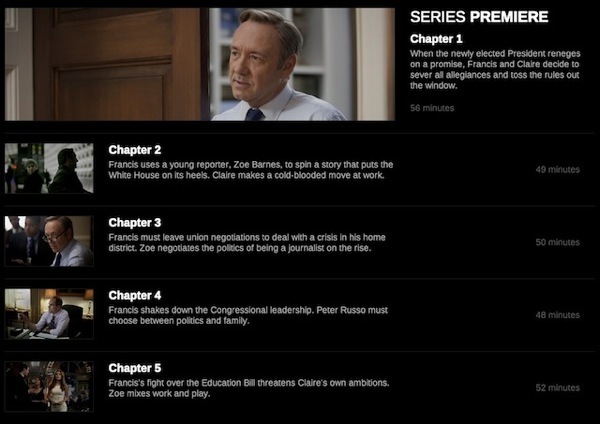 You’ll be able to view Netflix from your Mac/PC, iOS device, Apple TV, XBOX 360, PS3 or Wii. 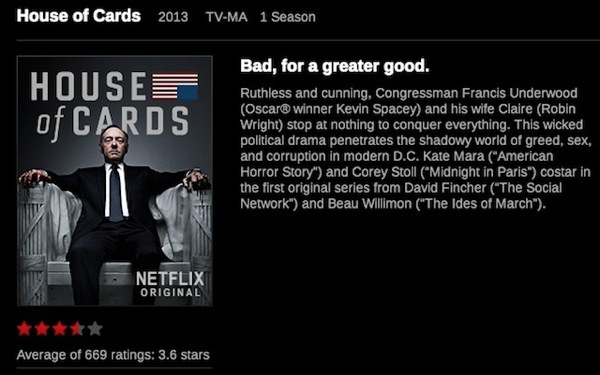 Let us know what you think of House of Cards.